This was my second visit to Doodhsagar waterfalls. Last August I’d gone there by train- the falls was at its best post monsoon and we had real close look and great time [Read my first trip details here]. 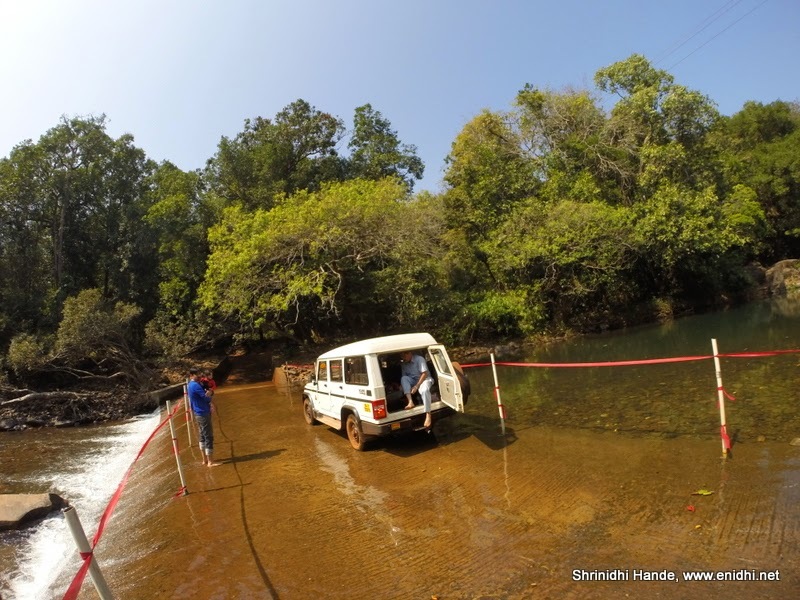 This time, by Jan End I had another chance to visit the falls- this time by road, offering a different view, thanks to Tata Safari DriveWithSOUL event. We went to Doodhsagar falls Taxi Stand, which is close to Kollem railway station (from where we’d boarded the train last time). From here, private vehicles are not allowed till the falls. Partly because the road is bad and involves crossing couple of streams, mainly because local taxi mafia is very strong and is hell bent on protecting their revenue earning opportunity at all costs. There are over 400 taxis with forest department permit to take tourists to Doodhsagar falls-usually only half of them get business on weekday and may be one third on a weekend. With roads closed between June to October, they need to earn their bread during rest of the year, with one trip in two days on an average. The waterfalls is about 12 kms from the taxi stand, having to cross 2 water streams and a checkpost. There’s a camera entry fee of Rs 30 per still camera and Rs 150 for video camera. No charges for mobiles. Almost all cameras are capable of shooting videos- so this excess fee for video camera should be abolished in my opinion. The drive took about 45 minutes, often inducing back pain to those sitting in the back. On the way driver showed us a temple and also tried to pickup a stranger saying he is from forest department... Passengers objected that there's no space, then driver proceeded without him. Drive also showed us the path under the railway line from which Bike Pilots would join the road during monsoon season. (Since road will be closed that time due to high water levels in the streams, bikers take tourists to waterfalls from a different route that only two wheelers can use.). Also we noted that the vehicle had No audio system- driver said if installed they get damaged within weeks due to poor road conditions. Once near the falls, there’s another 10 minute walk to the falls area. Tourists are given 1 hour time to return to the falls, which people seldom comply. (It takes 10 minute walk to the falls and another 10 minute to come back, with only 40 minutes at the falls, not counting time it takes to change dress, queue at the bio toilet and so on. That is too short a time at a magnificent falls after coming all the way and paying hefty fee to the taxi guy. I think they should give about 2 hours minimum- because anyway the taxi guy is very unlikely to get another ride same day. As I observed, most of the people take 90 mins or more, taxi drivers crib that it is too late, in hope of getting some good tips. The Dudhsagar falls, in its bottom view, was obviously not as full and overflowing as it was in August. But nevertheless it was eye-catching. 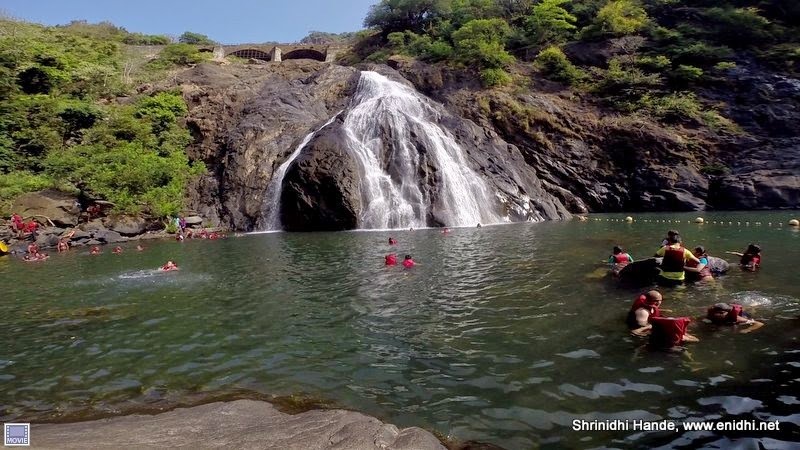 Below are some photos of the Doodhsagar falls. We got to see two goods trains crossing over while we were at the falls. Beware of monkeys in the area. Two changing rooms- one for men and another for women are set up near the falls. A bio toilet is also available. How much do the taxi charge per trip? And I heard there is a hiking trail as well? Is that open? I loved it in Chennai Express movie! It's only a 10 minute walk? That's great news. I was under the impression that the only way to get there was through that long trek on the railway track (I'd read about that a few times). And that one hour sounds so unfair. So does the video camera fee. @Nisha: Rs 400 per person for round trip, upto 6 pax per jeep. It was Rs 300 last year. Not aware of separate hiking trail. THere is a bike trail for sure, same can be used for trekking. While returning I saw few people getting down mid way and walking back instead of taking jeep. By Rail is another option, much cheaper. We'd tried that last August- check my earlier post. Thanks ! I'll go in July . Can I get down in dudhsagar if I go there by train ? From what I heard, Bike taxis charge Rs 500 per person.